The 2016 issue of the Journal largely resulted from a conference organised by the Ostrogorski Centre and the UCL School of Slavonic and Eastern European Studies in London in March 2016. The conference gathered around 20 scholars of Belarus from the United Kingdom, Germany, United States, Canada, Poland, and France. Three papers were selected for publication alongside the annual lecture on Belarusian Studies delivered by Professor Andrew Wilson. 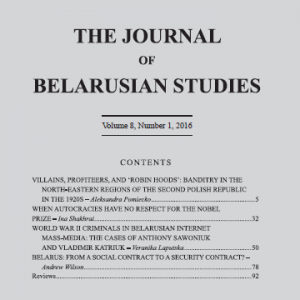 In the issue’s first article, Aleksandra Pomiecko of the University of Toronto writes about the bandit-partisans of West Belarus in the 1920s. She notes that the history of the Second World War has often overshadowed less well-known parts of Belarusian history, such as the anti-Bolshevik movements on the territory of Belarus. The article analyses portrayals of bandits in newspapers to understand local perceptions in Belarus. The bandit Ataman Mukha exemplifies the ‘heroic’ and ‘cultlike’ effect of bandit organisations, and his portrayal illuminates local sentiments and perceptions. Collectively, the article seeks to describe local sentiments towards this phenomenon in the borderland region, which has traditionally been viewed in historiography from the perspective of occupational forces. Veranika Laputska of the Polish Academy of Sciences analyses Nazi war criminals in Belarusian Internet media discourse, discussing the cases of Andrei (Anthony) Sawoniuk and Vladimir Katriuk. The author distinguished between state-owned, ‘neutral’, and oppositional media coverage of the two war criminals. The author concludes that Russian propaganda wields profound influence on the Belarusian mass-media. She notes that rather than coming up with their own explanations, Belarusian state mass-media often merely echo the Russian media. This differs from the approach of ‘neutral’ and opposition newspapers, which in the majority of cases try to remain objective or oppose the messages of the Russian mass-media. Ina Shakhrai of Humboldt University in Berlin examines the reactions to Alexievich’s 2015 Nobel Prize win in Belarus and Russia. She focuses on the interconnections between the common Soviet past of the countries and the spread of nationalist sentiments in the post-Soviet space following the Ukrainian crisis. She argues that Alexievich’s dismissal of autocratic regimes, alongside her identity – encompassing Soviet, Russian, Belarusian and Ukrainian elements – prevents her from becoming a unifying figure in Belarus and Russia. Professor Andrew Wilson of University College London looks at how Belarus has transitioned from a social contract to a security contract after the start of the crisis in Ukraine. He observes a triple shift since 2014 as Russia became more aggressive towards its neighbours and Lukashenka shifted in a more statist direction, followed by part of the old opposition. Belarus has not been invaded, but a sense of threat, and a desire to avoid conflict, has led to a certain closing of ranks. Professor Wilson notes that it would be much easier for Russia to impose their own man at the top rather than break the bonds between the leader and the elite, or between the leader and society. Dźmitry Papko of Warsaw University reviews a new collection of texts by Valiancin Akudovič, one of the most renowned Belarusian philosophers. According to the review, Akudovič proves that Belarusian language, history, and culture are less important to the process of constructing the nation’s collective identity than the mere existence of the Belarusian state. Peter Braga of the School of Slavonic and Eastern European Studies analyses three articles on Belarus-China relations and the commitment of the Belarusian authorities to a high-risk strategy to bring in Chinese investment. The Secretary of the Anglo-Belarusian Society Brian Bennett also gives an annual account of the most important activities of the Anglo-Belarusian Society. The paper version of the Journal is available to purchase here. Diplomacy between Belarus and Georgia has taken on new life. On 20 December 2016 Belarus finally opened its embassy in Tbilisi. This decision, long and complicated for both sides, has proved their intention to renew bilateral dialogue. This step could also indicate a new Georgia–Belarus strategy towards Russia. Belarus and Georgia have never been strategic partners. The countries’ diplomacy suffered numerous crises due to the Russia-Georgia conflict and the strong ties between Belarus and Russia. Furthermore, the economic side of the partnership is at an extreme low as well. In 2016 Belarus – Georgia trade came to only $63m, making Georgia only the 57th most important trade partner for Belarus. Georgia and Belarus have had a rather complicated diplomatic history. Lack of progress in the development of bilateral relations between Belarus and Georgia has mainly been due to the Russia factor: Russia and Georgia suffered a severe diplomatic crisis in 2008. As Russia's ally, Belarus was expected to support its actions. However, after the conflict ended, Belarus made a surprising decision. The Belarusian authorities refused to support or recognise the self-proclaimed republics of South Ossetia and Abkhazia, going against Russia’s wishes. However, following this decision, Belarus nevertheless decided to freeze its partnership with Georgia. On May 22 2014, in an interview for the Russian channel Dozhd, Belarusian President Alexander Lukashenka disclosed that he had even rejected the former Georgian leader Micheil Saakashvili’s invitation to visit Georgia because of 'extra problems with the Russian authorities'. The sides turned a new page in bilateral dialogue in April 2015. The historical visit of Lukashenka to Georgia contributed significantly to diplomatic ties. During his first visit to the country, Lukashenka outlined his priorities for Belarus and made some key statements on important issues. Lukashenka mentioned that in the near future, the sides will be able to find solutions so the countries can 'live in the same family as the three countries once did'. He stated that there are is nothing inherently contradictory between the Georgian people, Belarusians, and Russians. How can Belarus benefit from the Russia-Georgia crisis? Today, the sides share common interests. Georgia enjoys a good reputation with EU countries. The country withdrew its CIS membership in 2008. Georgia and Belarus have also both joined the Eastern partnership programme. In June 2014 Georgia signed an Association Agreement with the European Union. Belarus could benefit from this situation. 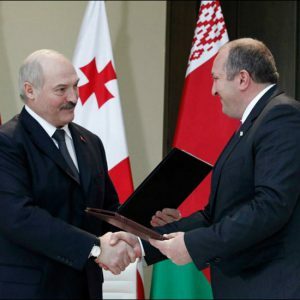 During his visit to Georgia, Lukashenka remarked that the sides did not have contradictory politics, and he expressed gratitude to former leader Micheil Saakashvili and President of Georgia Giorgi Margvelashvili for Georgia’s support of Belarus in the West. In his turn, on 24 April 2015 Margvelashvili stressed the importance Minsk's role in helping to find a peaceful way out of the situation in Ukraine. This statement could also be a signal for Russia to start a dialogue with Georgia. Thus, in the near future the partnership could lead to a diplomatic exchange between Georgia and Belarus. Belarus will receive more support from Georgia during dialogue with the EU, while Belarus will try to create a new platform for dialogue between Russia and Georgia. The opening of the new embassy following these statements proves the possibility of such a scenario. Belarus considers progress in economic relations to be a test of the possibility for future political normalisation. The first step in the development of relations is to achieve a $200m trade turnover in 2017. The Minister of Foreign Affairs of Belarus Uladzimir Makej paid an official visit to Georgia on 20 December 2016. Makej took part in the opening ceremony of the Embassy of the Republic of Belarus in Tbilisi. The '$200m-aim' is bolstered by the fact that the former head of the Belarusian Chamber of Commerce Mikhail Myatlikau has become the ambassador of Belarus to Georgia. However, this figure seems unrealistic. At the end of 2014, Belarus's trade with Georgia stood at $64.18m. In 2015 the bilateral trade was estimated at only $44.9m. To change the situation, the Chambers of Commerce and Industry of the two countries signed a package of 15 documents to more than triple trade. Deputy Prime Minister of Belarus Mikhail Rusy disclosed that more than 140 companies from Georgia and Belarus will be working on increasing the trade turnover. In the future, Georgia is likely to continue its strategy of cooperation with Belarus. Thanks to Belarus, jointly developed products of the sides can be sold on the markets of the Eurasian Economic Union. In 2006 Russia banned Georgian wine products despite the fact that Russia accounted for 80% of Georgian wine sales. However, Belarus is ready to allow Georgian wine makers to bottle wines and cognac spirits in Belarus, Rusy states. The sides are also establishing joint ventures with Minsk Tractor Works to produce vehicles. In March 2016, the two countries' businesses met in Minsk. Representatives of 50 Belarusian and 30 Georgian companies discussed ventures projects in mechanical engineering, pharmaceuticals, petrochemicals, and food production. A new page of Georgia-Belarus relations could result in two scenarios. Firstly – Belarus suffers another diplomatic crisis with Russia. In this case Belarusian authorities would start developing economic relations with Georgia to gauge Russia’s reaction. In the second scenario, there is an agreement between Belarus and Russia to start normalising relations between Georgia and Russia. The second scenario appears more realistic at this time. During the opening ceremony of the Belarusian embassy, the two sides agreed to continue constructive dialogue and mutual support within the EU's 'Eastern Partnership' initiative. This can be regarded as part of the deal. What's more, Belarus and Georgia also discussed facilitating an official visit from the president of Georgia to Belarus in 2017. The visit could result in a final high-level agreement on normalisation. Dzmitry Halubnichy is an analyst at the Centre for Strategic and Foreign Policy Studies in Minsk, Belarus.